I love any excuse for brunch. It makes me think of sunny days, meeting up with friends, and unlimited mimosas. On these special occasions I often splurge for Eggs Benedict or Florentine – who can resist a fluffy English muffin topped with Canadian bacon or spinach, a poached egg, and plenty of creamy Hollandaise sauce? But with Valentine’s Day fast approaching, there’s something even more romantic about preparing a lazy brunch at home for your loved one(s). And, despite its reputation Hollandaise sauce is easily prepared – it just takes some care and finesse. 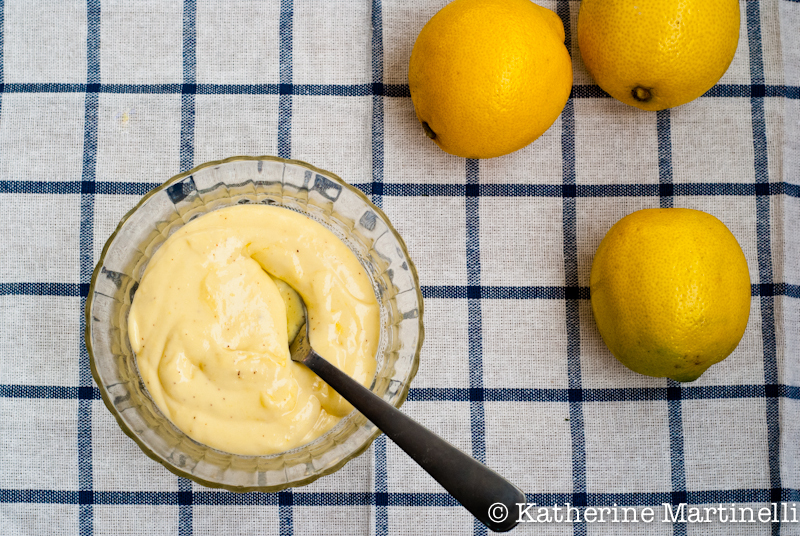 Hollandaise is one of the five mother sauces of French cuisine (when my husband and I play trivia together this is always one of my favorite questions; the other four are béchamel, espagnole, veloute, and tomate). So it’s a good one to master as it teaches important skills about emulsions and is the basis for other sauces like bernaise. Making it is quite similar to making mayonnaise, although the heat requires closer attention. Egg yolks are whisked over a double boiler set over low heat. Then warm (not hot) melted butter is whisked in very slowly. Finally, lemon juice and cayenne are added to add a hint of acidity to the luxurious sauce. People tend to face two major issues when making Hollandaise sauce. The first is that the egg yolks scramble instead of becoming light in color and doubling in volume. If this happens it is an indication that the heat is too high. The only thing to be done with scrambled egg yolks is to throw them out and start again, this time over lower heat. The other problem that can occur is that the emulsion “breaks.” This means that instead of the egg yolk and butter combining into a smooth sauce, the two are separate. Typically this happens during the phase where you are adding butter, and while this used to happen to me I’ve discovered a beautiful fix: if you notice that the sauce begins to look grainy and slightly curdled, that is an indication that it is about to break. Immediately stop what you are doing and add a splash of cool water, then whisk vigorously until completely smooth. That should fix it and you can resume adding butter. I have also found that methods promising for an “easy” or “quick” Hollandaise don’t work as well and are more difficult to rescue. I’ve tried and failed to make it in the blender. And, always a fan of my electric whisk (it works miracles with whipped cream), it just didn’t do the trick with Hollandaise. Nothing seems to beat a traditional wire whisk and some good old fashioned elbow grease. Hollandaise really should be enjoyed immediately. You can keep it warm while poaching the eggs (it’s also great on steamed asparagus) but I wouldn’t keep it too much longer than that. Apparently you can freeze it, but I’ve never tried. For a delicious variation you can also make chipotle hollandaise by adding a pinch of chipotle powder. 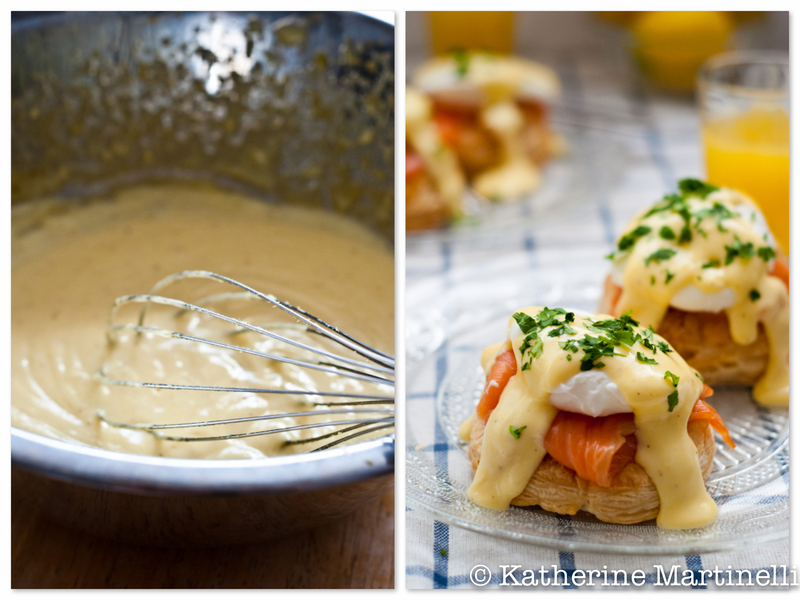 Don't be intimidated by making Hollandaise sauce at home! With a little care and patience you'll be turning out restaurant-quality brunch fare in no time. Serve this sauce on Eggs Benedict (or any variation) or steamed asparagus. Melt the butter over very low heat (or in the microwave). Skim the fat off the surface and set aside to cool slightly. Put the egg yolks in a heat-proof metal bowl and whisk until fully beaten. Place the bowl so it fits over a small pot filled with about 1-inch of water. Turn the burner to medium-low and whisk until the water is lightly simmering and the eggs are lightened in color, doubled in volume, and thick (do not allow the water to boil, and be careful not to scramble the yolks). Lower the heat. While still whisking the yolks, add a few drops of the melted butter. Once fully incorporated, continue adding the butter in a very, very slow stream while constantly whisking. If you notice that the sauce begins to look grainy and slightly curdled, that is an indication that it is about to break. Immediately stop what you are doing and add a splash of cool water. Whisk vigorously until completely smooth. Resume adding butter. Once the butter is fully incorporated, add a dash of salt and cayenne and whisk in 2 teaspoons of lemon juice. Taste and add more salt, cayenne, and/or lemon juice (up to 8 teaspoons) as desired. Remove from the heat and set aside while preparing the eggs. Whisk occasionally to prevent a skin from forming. Use within 1 hour. I’ve been wanting to try this! I can’t imagine storebought being any good next to this! I wanted to let you know,that I tried your recipe and it worked great! I really impressed my step dad who is the chef of the house. Great stuff, and it’s the best I’ve ever eaten. I recently saw a brunch recipe for eggs that listed the packaged stuff. I thought, if I was going to take the time with the egg preparation I would follow through with homemade sauce. Now here you have posted the recipe-we were on the same thought! Putting this in the to do pile, thanks. Haha that is funny. I totally agree Tina! I didn’t even post a recipe for the rest of the dish because the sauce is the “hard” part! But really it’s easy and so much more delicious than anything you’d get in a package. You’ll have to give it a try Manu!! It’s absolutely the best on asparagus. This is on my foodie “bucket list”. Oh good!! I do hope you try it soon and let me know how it turns out 🙂 Thanks Jen! Yours looks fantastic! Utterly perfect on asparagus. I don’t think it’s anyone’s waist’s friend… it is a sauce made out of egg yolks and butter! But that’s part of what makes it such a special treat 🙂 I hate when it separates! Fortunately since learning to tell when that’s about to happen and discovering that trick about adding a few drops of water it hasn’t happened to me… Thanks Kiri! your egg benedict with salmon look so good! thanks for making hollandaise sauce look so easy 🙂 buzzed! Thank you Shannon!! 😀 I’m so happy to have made it look doable – it really is! First off, your salmon eggs benedict should be on the cover of Bon Appetit..and in my mouth! Love hollandaise so much, I always order extra or make extra. I love hollandaise sauce!! Benny’s are my all time favorite breakfast food!! Yummmmmm! Yours sounds incredible!! Me too!! They are one of the best ways to indulge at brunch 🙂 Thanks Katie! I made hollandaise once and I felt very proud. But I didn’t really like it, so I never repeated it. I think I should try flavoring it and see if I appreciate it more. It is something to feel proud of when you make it! Hmmm do you normally like it on eggs Benedict? The great thing about making it home is that you can flavor it any way you like. I like mine (much like my mayo) very lemony so I get to adjust that. It’s also awesome with chipotle powder as seasoning! I have to admit that I have never even tasted Hollandaise sauce. I love the look of your combo of salmon and poached eggs. Thanks Nic! The cayenne is barely perceptible but does add a nice something. I never knew what hollandaise sauce was. At one of the hotel where we were staying they served it in breakfast. I did not touch it thinking it might have flour in it. Now, I miss that when everybody says how tasty it is. Do ask at restaurants. Most do not make the sauces themselves and the packaged is not gluten free. I’ve had hollandaise on my list of foods I want to try making for ages now. Yours looks absolutely perfect! I don’t make it at home all that often, but it does make for a special treat 🙂 Thanks Nami!! Hollandaise is another one of those wonderful things that I’ve never made. You can’t have Eggs Benedict without it, so obviously I’ve never made those either. Order them all of time though. Thank you for posting this recipe and all of the notes on how to make it right. You hint associated with the ‘breaking’ is interesting. Being a science nerd, I’m sitting here trying to figure out why that works. Guess I’m going to need to make it to figure it out. 🙂 Great post! I don’t make it all that often (I’d have heart disease and a big belly if I did), but it makes for a special brunch at home! I can’t tell you the science behind the breaking (I’d be interested to know what you find out!) but I can tell you it works. Somehow. I think it has something to do with temperature, but I’m really not sure. It’s all very cool though. Thanks Abby!! Let me know how it turns out if you do try it! Oooh, a classic! Always great to see these. I usually make Hollandaise by hand these days (it takes very little time) but when I made it in the blender I never had a failure. Interesting that you’ve had problems. But I always add an extra egg yolk when I use the blender (4 egg yolks instead of 3) and use only 1 stick of butter (but that’s what I use when making it by hand, too). Anyway, good post – thanks. Hmm I’ll have to try again in the blender. Although I’ve got the whisking method down so maybe I’m better off not messing with it 🙂 Thanks! Oooh, lots to love here. First of all, the 5 French sauces…I have to get going to learning all of those! Terrific trivia. Also, I adore Hollandaise sauce and could eat it on just about anything. Your photo of Eggs Benedict with salmon has me drooling. And lastly, brunch rules – definitely my favorite meal to eat out or to host. Thanks Hannah!! Brunch is the best. I don’t host it nearly enough – it’s so fun! Wow! It came out perfectly, I scored big points too. Unfortunately, I realized what really is in hollandaise sauce; my arteries are still recovering. Seriously though, thanks for the directions and your reply. You brought a little bit of sunshine into two lives this weekend and in my book it doesn’t get much better than that (karma and what not). Thanks again and take care. Haha I had the same reaction when I first made hollandaise – it is definitely special occasion food, not everyday fare 🙂 I am so happy that it came out well and that you both enjoyed it. You’ve made my day! Hi Katherine. Your recipe is very easy and the first few steps worked out for me. Everything was perfect until I added a little bit of the lemon juice (fresh of course) as you suggested and everything was fine. The taste was good and looks the way my favorite restaurant makes it. As soon as I took the bowl off the stove the eggs and the butter separated and there was no way to save it. I figured I might have put too much lemon juice in (about two good squeezes of half a lemon). I don’t know what happened because it was ok. Help! What did I do wrong? Oh no! So strange. The lemon juice shouldn’t have had that effect. If whisking vigorously and adding a few drops of cold water didn’t help, then I don’t know what would! I usually keep the sauce warm by leaving it turning off the heat but leaving the mixing bowl over the pot with water. Maybe the temperature change had something to do with it? I’m sorry it went wrong right at the end and hope it turns out better next time! i am going to make this sauce for eggs benny this morning. it is my daughter and my favorite breakfast. i have never made my own sauce. will let you know it turns out. thanks for the easy recipe. I have learnt first hand that homemade hollandaise is better than store bought and well worth the preparation and cook time…. However while I’ve made some good hollandaise with a recipe much like yours, I have never been able to make it as creamy as the hollandaise I order with eggs Benedict at my favorite coffee shops and cafés 🙁 any suggestions – somehow I think it’s going to be more complicated than adding cream? Hm I can’t say for sure but I think the most important step in terms of achieving that thick yet pourable consistency is when whisking the eggs in the beginning – don’t stop just when they’re combined or a little thick. You really do want them to double in volume, which can take a bit of elbow grease but yields wonderful, velvety results. These look so scrumptious! can’t wait to try this..!! I just made this tonight, the first time I’ve ever tried to make a real sauce of any kind (cause spaghetti sauce doesn’t count… lol). Quite ambitious of me!! But it came out PERFECT!!! And we had it over corned beef hash with poached eggs. Is there a difference & why, using salted or unsalted butter? Is it a texture or taste difference? I typically use unsalted butter in recipes so that I can control the amount of salt that goes in. You could certainly use salted butter and omit any other salt, adding it to taste if necessary. It should not effect the texture. I add the salt, half the lemon juice and a 1/2 tsp Dijon mustard to the egg yolks at the beginning. The mustard and salt help emulsify the sauce and keep it together. Another trick to avoid curdling, is to have a thick, wet dishcloth right next to the stove. If the mixture threatens to curdle, remove the pan and set on the wet cloth and beat like crazy. This will reduce the heat right away and (hopefully) stop the curdling. The classic way to “save” a hollandaise sauce which has curdled, is to redo it with extra egg yolk. When this happens, promptly remove the sauce from the stove. Pour into another bowl or container, set aside while you get another egg yolk ready. Then add this egg yolk to the pan, put pan over hot (not boiling) water and s-l-o-w-l-y add the curdled mixture while whisking all the time. Your hollandaise should be even richer and tastier. Can i keep this in the fridge in a closed container? Will I be able to use it throughout the day? Great question! Hollandaise sauce is quite temperamental and is best served right away. I usually keep it warm on the stovetop over a pot of not even simmering water until I’m ready to serve it (usually just while I poach the eggs). Refrigerating it might cause the sauce to separate. I’ve never tried it, but if you’re really in a pinch you can try refrigerating it and very gently heating it up over low heat (again over a pot of hot water), whisking the whole time. To answer your question, yes, you can refrigerate hollandaise sauce. It becomes hard like butter. To serve it you put in a pot over hot water, same as when you made it, and stir not stop until it melts slightly and comes together. Mind you, there is rarely any Hollandaise sauce left over at my place. Pingback: Eggs Benedict – Fashion. Food. Flair. Just tried this receipe sauce turned out well but the lemon juice seems to be very strong in this reciepe. Im so glad i nailed it first ho.